The unique concept of Cafe Barbera is based on it’s selection of exceptional coffees in Italy, current food trends and a consumer demand for a fresher, tastier, lighter & healthier menu where it provides a venu to relax in, a warm & inviting yet elegant dining experience. Along with the highest quality freshly roasted coffee products, it offers a varieties of food items such as in-house baked pastries, handmade shakes, juices, a large array of freshly made soups and salads, sandwiches on Ciabatta breads, pizzas, pastas, main course meals and desserts. 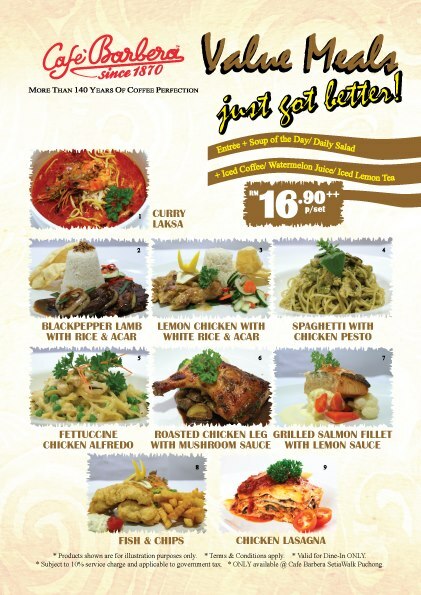 MUST TRY: Cappuccino Italiano, Prawn Aglio Olio; Pesto, Cheese & Mushroom Pizza, Braised Lamb Shank, Chocolate Fondant & Affogato! !